Beyonce has ditched those polarizing baby bangs and has added an exciting new endeavor to her portfolio. Beyonce has teamed with Topshop for a clothing line. Yep. Excuse us while we freak out just a little bit. Beyonce will launch an activewear line that will be comprised of clothing, footwear, and accessories for the dance, fitness, and sports categories. Most likely, following in the recent "athletic wear for all the time" trend, it'll be a range of stylish basics for active pursuits that will also translate to the street. Since Bey is infinitely stylish (duh) and spends much of her professional life dancing and rehearsing, she knows better than anyone what women need when it comes to quality activewear. Even though we know next to nothing about the Bey x Topshop partnership other than the fact that it's happening, it's safe bet that it'll be functional and fashionable, like Bey's stage costumes. The activewear trend continues to explode this year, with Alexander Wang for H&M leading the charge. I guess stylish sneakers really are here to stay. Thank goodness. Anyway, here's what we know so far about Bey x Topshop: It is a 50-50 partnership under the diva's Parkwood umbrella. It is a partnership and not a collab, which likely means that Bey will be intrinsically involved in all aspects of development, as opposed to just slapping her name on some designs and posing in ad photos. Of course Bey would come to Topshop on her terms and have to do something different when it comes to her fashion partnership. So many celebs allow their names, logos, or brands to be used on clothing, perfume, or makeup, offer some input, and appear in promotional campaign elements, and that's about it. 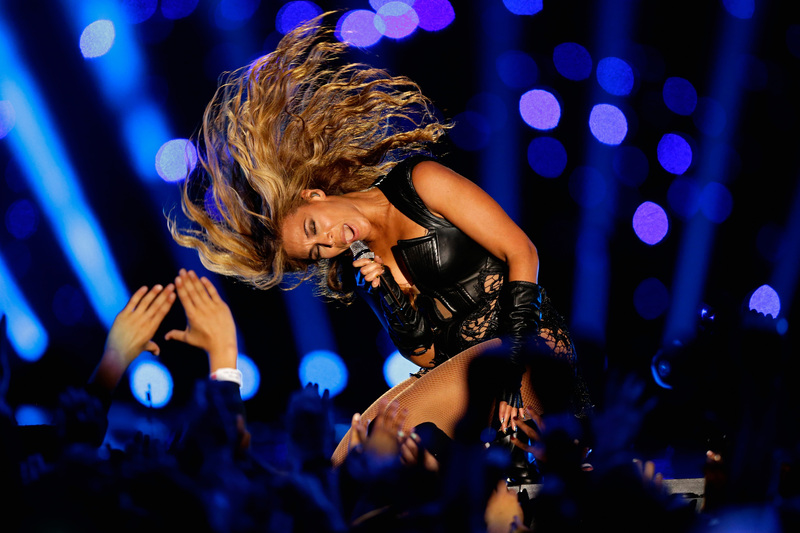 In Bey's case, it sounds like her team will be working shoulder-to-shoulder with Topshop. Sweet. A separate creative director and a team of designers will be hired specifically to work on Beyonce's range. The Bey x Topshop brand is as-yet unnamed. May we suggest a few monikers? "Flawlesswear," maybe? Perhaps "I Work Out Like Dis"? You can Venmo me my royalties anytime. Bey issued a statement about her latest fashion endeavor, saying, "I could not think of a better partner as I continue to grow the Parkwood business. I have always loved Topshop for its fashion credentials and forward thinking. Working with its development team to create and produce a technical and fashion-led collection is exciting and I'm looking forward to participating in all aspects of this partnership." Topshop's Philip Green echoed, "We have been looking at this category as fashion-inspired fitness develops, and know that this is right in our customers' heartland. Creating a partnership with Beyonce, one of the most hard-working and talented people in the world, who spends many hours of her life dancing, rehearsing and training is a unique opportunity to develop this category. Being partners with Beyonce and her team, who have the greatest creative energy and enthusiasm, is inspiring for all of the team at Topshop. We have much to achieve in just under a year, but we are all up for the challenge, and look forward to delivering athletic streetwear in an inventive and exciting way." Bey is no stranger to fashion lines, as she launched her own ready-to-wear House of Dereon line and she worked with H&M on a swimwear line last year. I cannot wait to see what Bey x Topshop come up with. While the designs likely won't be as sexified as what she wears on stage, I'm stoked. Topshop is higher quality and more fashion-forward than a lot of mass retailers. That, coupled with Bey's distinct point of view and the fact that she knows what she wants and loves to create things, be it songs or designs, that empower women, mean this will be one formidable pairing.